“Hong Kong Skyscrapers” by Estial, cropped and modified by Trevor Finney CC BY-SA 4.0. “Paris vue d’ensemble tour Eiffel” by Taxiarchos228, cropped and modified by Poke2001 and Trevor Finney CC BY 3.0 “London Bridge” by Skitterphoto, cropped and modified by Trevor Finney. Public Domain. “New York” by Mscamilaalmeida, cropped and modified by Trevor Finney. Public Domain. 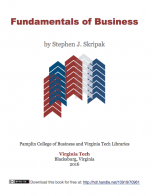 Fundamentals of Business by Stephen J. Skripak, Richard Parsons, Anastasia Cortes, Anita Walz is licensed under a Creative Commons Attribution-NonCommercial-ShareAlike 4.0 International License, except where otherwise noted. * All areas are covered comprehensively. Good book for introduction to business. Team work is included and maybe other types of student success skills could be covered as well for a first semester introduction to business concepts course. * Each chapter has a list of learning outcomes which are mapped to Bloom's taxonomy. This is very important for professors and helps when building course outlines/syllabus. * Each chapter has a key points or summary at the end. This is very good for students and can be used as a study tool. * The Hospitality chapter would not necessarily be used by our fundamentals business course, but it does add more depth and the concepts of customer service which is very important. We have a whole customer service course beyond the fundamental business course. * There is much information, which I prefer, in the book. Sometimes it is difficult to cover all chapters in a 14 week semester. Of course, we can always pick and choose the chapters we wish to cover. 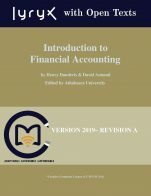 Some of the chapter topics are actual courses later in the program so they can be covered more lightly--for example, accounting and finance, we have introduction courses for each so the business fundamentals course does not need to go in to too much depth. 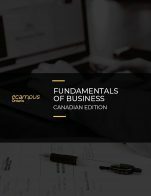 * The legal, union, economic, banking, accounting, finance, and business structures differ in Canada than they do in USA, but for the most part this book could be used in our Canadian business fundamentals course, but we would have to supplement chapters with Canadian content. I would love to take this book and adapt it for Canadian colleges. * The personal finance chapter is a good addition, but we would run out of time before we could get to it. * We used to have two separate courses, business fundamentals and student success, we recently combined these two courses and reduced the amount of business content to allow us to add some student success concepts (time management, mindfulness, stress management, teamwork) we did not have enough class time to cover the personal finance topic as well, but this is badly needed by today's young people. Happy to see it included here. * Overall, great job, nicely done. I would love to see PowerPoints and a testbank with this book--professors would eat it up! * Yes, accurate from what I could tell. * Some examples were rather old and could be more recent. * Some examples were very USA focused which may appear biased, but also when teaching in the USA it brings extra interest for students I suppose. I'm teaching in Canada so I would like a few Canadian company examples. * Much of the content is theory such as SWOT and management styles, production methods, accounting forms, and supply/demand so these will not be outdated any time soon. * The examples of companies may become outdated as news changes and companies change, but this is the same for any textbook. I did notice some newer examples dates 2015, but I also noticed examples dated before 2000 (maybe replace these with newer examples). * Yes, the language level seems reasonable. We have many English-as-a-Second-Language (ESL) students and the language and writing terminology is easy to follow and understand. * Layout and flow of topics also enhance the ease of reading and understanding. * Yes, I did not notice any contradictions or oversights. * Yes, the chapter contents are provided in chunks with headings and sub-headings that are easy to identify and follow. * Yes, no enormous blocks of text that I noticed. * Diagrams and charts also help understanding. * A professor could use the chapters out of sequence as I did not notice much referencing from subsequent chapter to previous chapters. This is sometimes done in textbooks such as in chapter 8 one might read "Remember in chapter 4 you covered..." and this sometimes causes a bad flow because professors would have difficulty using chapter 8 before chapter 4. Also, when chapter 8 continues in more depth on what was discussed in chapter 4. I don't think this book does that and it seems easy to mix and match the chapters so as to choose the most relevant for what we would want to cover in the course. * Yes, for the most part. I may not have chosen the same order, but every professor has a preference for the order of teaching these chapters. * I found it odd that teamwork was first, but then I thought it was a brilliant idea because we could place students in study teams early in the course and have them working together throughout. * I like to leave Ethics and CSR until later in the book and move Marketing and Operations up. Some professors like to have Accounting sooner so they can assign tasks to students regarding income statements and balance sheets. * Yes, I like the flow, colour, headings/subheadings, and easy of reading. * None that I noticed. * There are many references to US company or news, but is inclusive and global in many areas too. * Not culturally insensitive or offensive. * There are references to other countries and inter-cultural communications and diversity. * I really like the book, good coverage, lots of material. * It would be nice to add a few short quiz questions at the end of each chapter. * It would be nice to have PowerPoints with the ebook. 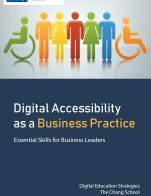 * It would be nice to have a testbank with the ebook. 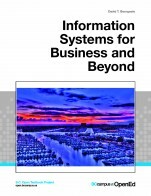 The text covers all the critical areas expected in an introduction to business course. The text provides 17 individual chapters as well as a preface on the topic of Teamwork in Businesses. The text provides a table of contents that links the reader to the chapter. There is also a text reference at the end of the text. There is no "glossary, " but words are defined throughout. There is no index provided. The text includes diagrams, visuals, and other supplementary material. The material appears to be accurate and error free. The material is written for an American audience but can be supplemented with Canadian or International examples as needed. The text was written in 2016. The content appears to be up-to-date and with relevant examples. The text could be updated as needed if one wanted to update or provide additional materials. The text is well written and easy to understand. A first-year student should have no problem with the text and content. The key take-aways summarize the chapter in an easy to follow format. The terms in the text are defined. It would have been useful to have a glossary or an end of chapter definition key. The framework of the book is clear and easy to follow. The key takeaways provide the user a solid overview of what was reviewed. The text is broken up into 17 chapters. The chapters are easy to follow and can be broken up into other topics and sections. The reader should be able to read the table of contents to get an overview of the contents. Each chapter identifies of what is going to be covered, and the key takeaways sum up the final readings. Each chapter is clearly laid out. The material is presented in a logical and clear fashion. The text does not seem to have any issues with the interface or images. Everything appeared to be in working order. Minor issues that most people would not notice. The text is free of biased language. The text is up to date and provides excellent examples. I think the instructor could provide Canadian examples or case studies in the material if needed.